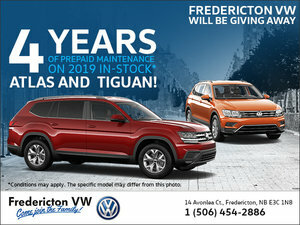 Fredericton Volkswagen, in cooperation with VW Canada, also offers VW's Protection Plus to extend your warranty up to 10 years and 200,000 km. If your car breaks down, you get rental car benefits up to $200, trip interruption reimbursement up to $500 and roadside assistance up to $100 covering towing, winching, battery boost, fuel delivery, tire change and lockout service, anywhere in Canada and the Continental US. This is our life, critical illness, disability and loss of employment coverage program that is designed to protect your possible financial commitments from the impact of an unforeseen life event. You can be covered if you are between the age of 18-71 and your loans are up to $500,000. There is no medical examination required, and the rates are the same for all insured, regardless of age, height, weight, smoking, or occupation. The protection is cancellable at anytime, and by enrolling you can protect your credit standing. For $999 plus tax, which can be included in your total cost of finance or leasing, you are covered up to $10,000 with no deductible. So that when you will return your vehicle at lease end, you won`t have to pay for dents, paint scratches, glass damage, bumper and upholstery damage, worn tires and damaged wheels. If your favourite VW becomes a write-off, this program can assist you in paying for a new car, no matter what your insurance company covers you for. Contact us to give you a detailed solution that will fit your needs and will ensure that your family and your VW is covered, whatever the weather and wherever you are.